The Sri Lankan’s Oshadee Kottahachchi (Royal College), Sachini Ranasinghe (Musaeus College), Udith Jayasundara (Nalanda College), Nimantha Saranapala (Royal College), Yenushi Samindya Gallage (Dharmashoka College) and Amandhi Nayanathara Jayasooriya (Sujatha Vidyalaya) won Gold medals at the Under 15 Boys, Under 15 Girls, Under 13 Boys, Under 11 Boys, Under 9 Girls and Under 7 girls of the 4th Asian School Chess Championship held at Grand Oriental Hotel, Colombo from 8th to 15th December 2008. 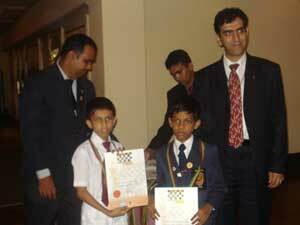 On be half of the Asian Chess Federation , the Championship was conducted by Chess Federation of Sri Lanka in 2 separate sections as Girls and Boys in 5 age groups, under 7, 9, 11, 13 and 15 years totaling 10 Asian school events. The closing ceremony was held in grand level at the Grand oriental Hotel under the patronage of Hon. 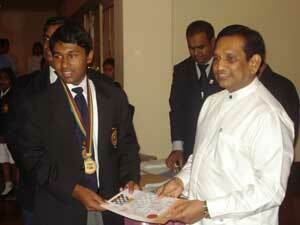 Dr. Rajitha Senaratne, The Minister of Construction and Engineering Services and Pr. 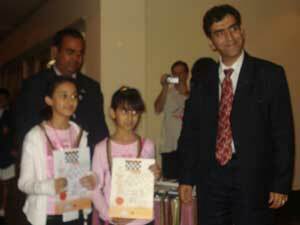 Mehrdad Pahlavanzade, The Treasure of Asian Chess Federation. 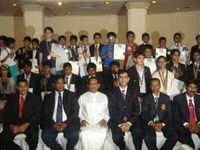 Five countries, India, UAE, Lebanon and Iran along with Sri Lanka participated in the event. Kottahachchy who won a Bronze medal in the World Youth Chess Olympiad in Turkey this year scored a total of 6 ½ points out of possible 7 games while Sachini got 3 ½ out of five games in their Championships. Udith Jayasundara scored 5 ½ and Nimantha Saranapala also scored 5 ½ in their Champion score out of seven games. Yenush was the only Sri Lankan who scored total 7 points out of seven games in under 9 years girls while Nayanathara scored 5 ½ out of 7 games in the under 7 girls event. Other four events were won by Indian players, under 13 Girls by Anjana S Krishna with 8 points out of 9, Under 11 Girls by Sunya Sakta Satapathy with 7 points out of 7, Under 9 Boys by Y Grahesh with 8 points out of 9 Under 7 Boys by Pranav Reddy scoring full 9 points out of 9 games.